Cured salmon is coated in nori and paired with zesty horseradish and bright vinaigrette. Finely chop the dill and chervil. Season the salmon with pepper, salt and sugar. Rub the salmon with the chopped herbs. Drizzle gin in a tray, place the salmon in the tray and drizzle some more gin on top of the salmon. Marinate, refrigerated, for 2 hours. Coat the salmon with the nori sheets, cut the salmon in 10 equal slices. Mix quinoa with fava beans and Hellmann's Sesame Thai Vinaigrette Dressing, season with salt and pepper. Semi whip the cream and add the grated horseradish to taste. Season with salt, pepper and fresh lemon juice. Mix the avocado and the lime juice until smooth. Add the wasabi paste, season to taste. 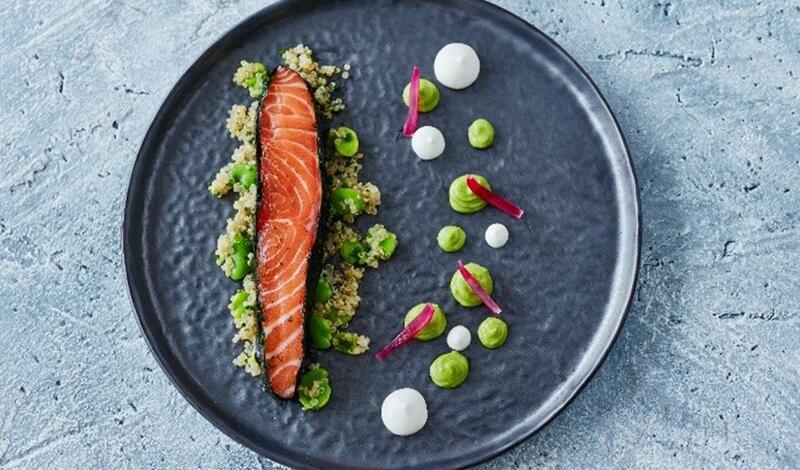 Start plating with the quinoa salad and top with a slice of marinated salmon. Use a squeeze bottle or piping bag to add the horseradish and avocado wasabi cream. Finish with pickled red onion.